CLINICAL CASE 1: A 23 YEAR OLD MALE WITH HEMATURIA FOR 2 YEARS, NOW WITH WORSENING RENAL FUNCTION AS WELL. THE PATIENT HAS PAST HISTORY OF RETINAL DRUSEN DIAGNOSED FEW MONTHS AGO. HIS C3 IS LOW AND C4 IS NORMAL, WHAT IS THE MOST LIKELY BIOPSY FINDING? 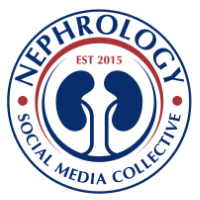 THE EYE IS A WINDOW TO KIDNEY DISEASES IN MANY INSTANCES. SLE, WEGNENER'S GRANULOMATOSIS HAVE EYE INVOLVEMENTS AS WELL; RETINAL HEMORRHAGES AND NECROTIZING SCLERITIS RESPECTIVELY. OTHER SYNDROMES THAT HAVE EYE AND KIDNEY INVOLVEMENT ARE ALPORT'S SYNDROME, SENIOR-LOKEN SYNDROME, CHARGE SYNDROME AND BARDET-MOON-BIEDL SYNDROME. MOST RECENTLY, THERE HAS BEEN AN ASSOCIATION OF DENSE DEPOSIT DISEASE WITH DRUSEN LIKE DEPOSITS IN THE RETINAL PIGMENT EPITHELIUM IN THE FUNDUS. 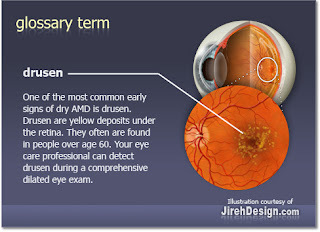 THE LESION IS SIMILAR TO THE AGE RELATED MACULAR DEGENERATION. these characteristics lesions are also associated with partial lipodystrophy with low serum C3, often accompanied by a circulating c3 nephrtitic factor or abnormality of complement factor h.
I f you have a patient with MPGN II or DDD, or think of that in the differential, have a look at the eye or look for drusen, question the ophthalmologist? you might be surprised. take a look at the recent NDT , the article by D’Souza and Short on The eye- a window on the kidney.